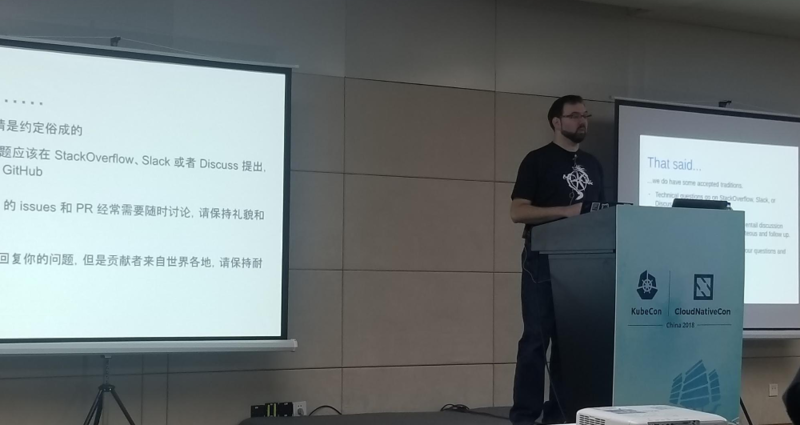 We recently completed our first New Contributor Summit in China, at the first KubeCon in China. It was very exciting to see all of the Chinese and Asian developers (plus a few folks from around the world) interested in becoming contributors. Over the course of a long day, they learned how, why, and where to contribute to Kubernetes, created pull requests, attended a panel of current contributors, and got their CLAs signed. This was our second New Contributor Workshop (NCW), building on the one created and led by SIG Contributor Experience members in Copenhagen. Because of the audience, it was held in both Chinese and English, taking advantage of the superb simultaneous interpretation services the CNCF sponsored. Likewise, the NCW team included both English and Chinese-speaking members of the community: Yang Li, XiangPeng Zhao, Puja Abbassi, Noah Abrahams, Tim Pepper, Zach Corleissen, Sen Lu, and Josh Berkus. In addition to presenting and helping students, the bilingual members of the team translated all of the slides into Chinese. Fifty-one students attended. The NCW takes participants through the stages of contributing to Kubernetes, starting from deciding where to contribute, followed by an introduction to the SIG system and our repository structure. We also have “guest speakers” from Docs and Test Infrastructure who cover contributing in those areas. We finally wind up with some hands-on exercises in filing issues and creating and approving PRs. Those hands-on exercises use a repository known as the contributor playground, created by SIG Contributor Experience as a place for new contributors to try out performing various actions on a Kubernetes repo. It has modified Prow and Tide automation, uses Owners files like in the real repositories. This lets students learn how the mechanics of contributing to our repositories work without disrupting normal development. Both the “Great Firewall” and the language barrier prevent contributing Kubernetes from China from being straightforward. What’s more, because open source business models are not mature in China, the time for employees work on open source projects is limited. Chinese engineers are eager to participate in the development of Kubernetes, but many of them don’t know where to start since Kubernetes is such a large project. With this workshop, we hope to help those who want to contribute, whether they wish to fix some bugs they encountered, improve or localize documentation, or they need to work with Kubernetes at their work. We are glad to see more and more Chinese contributors joining the community in the past few years, and we hope to see more of them in the future. The workshop ended with a panel of current contributors, featuring Lucas Käldström, Janet Kuo, Da Ma, Pengfei Ni, Zefeng Wang, and Chao Xu. The panel aimed to give both new and current contributors a look behind the scenes on the day-to-day of some of the most active contributors and maintainers, both from China and around the world. Panelists talked about where to begin your contributor’s journey, but also how to interact with reviewers and maintainers. They further touched upon the main issues of contributing from China and gave attendees an outlook into exciting features they can look forward to in upcoming releases of Kubernetes. SIG Contributor Experience will continue to run New Contributor Workshops at each upcoming Kubecon, including Seattle, Barcelona, and the return to Shanghai in June 2019. If you failed to get into one this year, register for one at a future Kubecon. And, when you meet an NCW attendee, make sure to welcome them to the community.